The Peanuts comic strip made it’s debut on October 2, 1950. It eventually appeared in more than 2,600 newspapers in 75 countries, was published in more than 40 languages, and read by an estimated 355 million people. 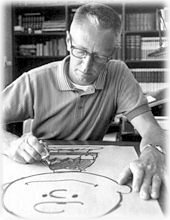 It became the worlds most widely read comic strip. In 1965 Snoopy saw his first combat action when he turned his doghouse into a Sopwith Camel, and flew back to the skies of WWI to shoot it out with the Red Baron. Snoopy would see combat again in another war. In 1966 he sailed into Vietnamese waters aboard the guided missile destroyer USS Goldsborough. His presence onboard was requested by the ship’s Supply Officer and cruise book editor, LT N.W. Tarr. Permission was granted by Mr. Schulz. and Snoopy reported aboard on 26 May 1966 at Hong Kong. 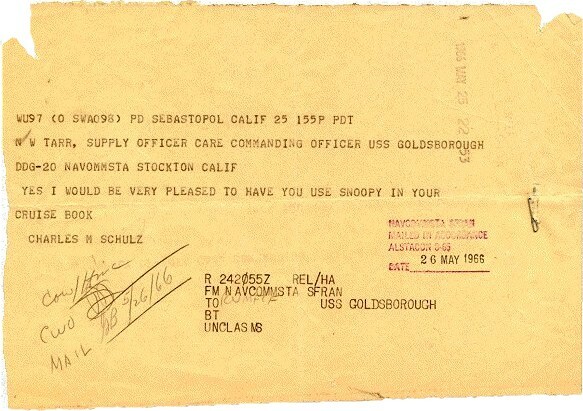 Charles Schulz sent this telegram to the GOLDSBOROUGH in Hong Kong granting permission to use the “Snoopy” character in the ship’s 1966 cruise book “Discover the Orient”.